Southeasterly view of the U.S. 74 freeway from the U.S. 74 Business overpass west of Rockingham. Photo taken 12/21/08. U.S. 74 is a major east-west highway that traverses the state of North Carolina. Many sections of U.S. 74 were upgraded to limited access standards, some of which are incorporated in the Interstate 74 corridor from Rockingham to Wilmington. The US highway concludes in Wrightsville Beach at a cul-de-sac, over 400 miles from the point where U.S. 74 enters the Tarheel State from neighboring Tennessee. Section AA - 2 miles from west of Peachtree Road to east of Kimbrell Road. Construction started in July 2013 and was completed in September 2016. Section AB - 1.9 miles east from Kimbrell Road to east of Plato Lee Road. Work started in July 2014 and continued through 2018. Section B - 2.6 miles east from Plato Lee Road to N.C. 226. Work ran from July 2014 through 2018. Section C - 5.3 miles from N.C. 226 to west of N.C. 150. Ongoing construction started in 2017. Section D - 4.1 miles between N.C. 150 and U.S. 74 west of Long Branch Road. Right-of-way acquisition starts in 2019, followed by construction in 2021. Section E - 2.6 miles from Long Branch Road to Stony Point Road and U.S. 74 Business in Kings Mountain. Design work runs through 2018, followed by right-of-way purchases in 2019 and construction in 2021. Through Charlotte in Mecklenburg County, $101.2 million in right of way and construction converted a 1.6-mile section of U.S. 74 along Independence Boulevard into a limited access highway. Work underway from April 2013 to fall 2017 upgraded Independence Boulevard southeast from N.C. 24/27 (Albemarle Road) to a point east of Wallace Lane. Interchanges were built at Sharon Amity Road and Idlewild Roads and Conference Drive was elevated to cross U.S. 74 on a new overpass. Further southeast along U.S. 74, the Monroe Expressway is a new toll road under construction that will allow through traffic to bypass Monroe and Wingate from Interstate 485 to Marshville. Partitioned into six sections, work started on the nearly 20-mile long highway in May 2015 and continues through November 2018. 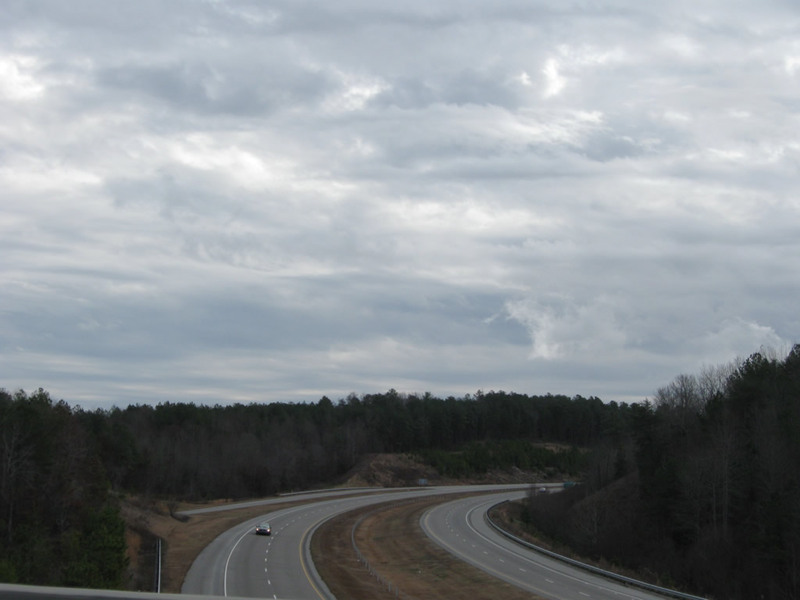 Designated U.S. 74 Bypass, the toll road will be operated by the North Carolina Turnpike Authority. U.S. 74 at Wilmington was rerouted from an overlap with U.S. 17 and 76 through downtown onto the Isabel Holmes Bridge (Parsley Street Bridge) when the Martin Luther King, Jr. Parkway was completed in September 2005. The parkway comprises a controlled-access route from North 3rd Street east to U.S. 17 Business (Market Street) at Eastwood Road, U.S. 74's original alignment toward Wrightsville Beach. North 3rd Street leads out of Downtown Wilmington to U.S. 74 & North Carolina 133 (Martin Luther King Jr. Parkway) at the east end of the Isabel Holmes Bridge. Photo taken 11/11/06. 3rd Street north defaults onto U.S. 74 east & N.C. 133 (Martin Luther King Jr. Parkway) north ahead of McRae Street. U.S. 74 & N.C. 133 span the North East Cape Fear River west and merge with U.S. 421 south to Eagle Island. Photo taken 11/11/06. 3rd Street directly links with the Isabel Holmes Bridge west above a wye interchange with U.S. 74 & N.C. 133. Traffic signals operate at the westbound merge ahead of the double leaf bascule. Photo taken 11/11/06. The Isabel Holmes Bridge, which carries U.S. 74 & NC 133 over the North East Cape Fear River, was formerly part of U.S. 117 before the highway was rerouted onto NC 132 and Shipyard Boulevard. Photo taken 05/29/05. North 23rd Street is an urban collector joining U.S. 17 Business (Market Street) with U.S. 74 (Martin Luther King, Jr. Parkway) in Wilmington. Photo taken 12/31/17. U.S. 74 bypasses Wilmington west to Leland and east to Fairview Road en route to Wrightsville Beach. Photo taken 12/31/17. Martin Luther King, Jr. Parkway is an expressway encircling the north side of the Wilmington city limits between the Isabel Holmes Bridge across the NE Cape Fear River and Fairview Road at U.S. 17 Business (Market Street). Photo taken 12/31/17. North 23rd Street and U.S. 74 converge on respective bridges over Smith Creek. Photo taken 12/31/17. The parclo B2 interchange joining U.S. 74 with North 23rd Street lies 1.42 miles north of U.S. 17 Business (Market Street). Photos taken 12/31/17. "Work to construct new US 74/I-26 interchange to start this week." Tryon Daily Bulleton (NC), October 23, 2017.